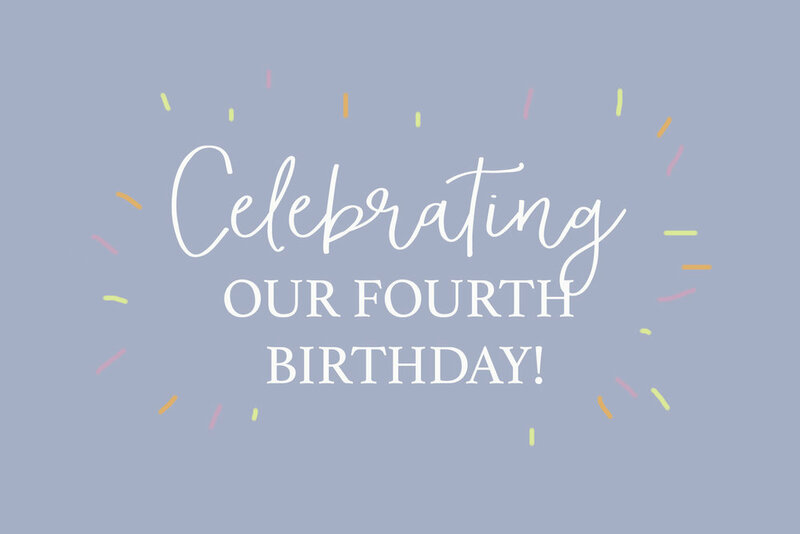 Four years ago today, Prairie Letter Shop started as Magnolia Letter Arts, complete with a very simple Etsy site and some very DIY product images. :) In four years, the business that began with rubber stamps and envelope lettering has grown into a multi-faceted operation specializing in wedding invitations, workshops, and educational products. The business that started in a 300 square foot garage apartment (my"bachelor-ette pad"--with no heat, by the way!) now occupies the back half of a space shared with Merriment Paper & Gifts in midtown Tulsa. To date, we've taught hundreds of people how to hand-letter, and we've shared thousands of lettering journals with the world. We've served more than 100 couples with wedding paper. But we started so, so small. It took me over a month to find a stranger who would take a chance on my shop. To close my first sale, I had to negotiate with a bride to let me address her envelopes for less than a dollar a piece--and there was a LOT of convincing on my end. But in time, the shop grew, thanks to the power of word of mouth referrals and good old fashioned social media. Fast forward a year and a half, and I was ready to leave a full-job I loved coaching teachers and took a huge risk on full-time entrepreneurship. I left a rewarding career, a comfortable salary, a strong team, excellent health insurance, and paid vacation. It was a risky move, but one that was necessary at the time. When I started my business, I was trapped in a cycle of striving for self-worth. I thought that I could perform my way to fulfillment and happiness, and that if I did a perfect job as a teacher, I'd be one step closer to being a "good person." Following my creative passions felt indulgent. Fracturing relationships with students and teachers was painful. However, I got horribly burnt out, and the choice to leave my former life was sealed for me. I had developed a critical attitude towards my work. I didn't like the cynical, jaded person I had become after six years in what felt like a pressure cooker of trying to be perfect. I didn't realize it at the time, but this ugly burnout forced me to leap into new territory. This will forever be part of my testimony--that God uses brokenness, even the parts of our lives we want to bury. Once upon a time, I wondered if my business would ever be "good enough." This year, we were voted as one of Southern Wedding Magazine's top ten calligraphers in the South, and our work was featured on Style Me Pretty, Martha Stewart, and Wedding Chicks. I was honored to fly across country to teach at the Creative at Heart Conference. But the more milestones I hit, the more I realized that as much as they could be celebrated, milestones couldn't bring fulfillment, just like money and health insurance and pride in one's work couldn't bring fulfillment. So what has been fulfilling in the last few years? Learning to do more with less. Learning to be a better steward of the material resources I've been given. Learning to have faith in people to pick up the slack in a season of need. Growing in confidence that small steps add up, and they matter. Learning that relational time with people is far better than a big sale. Learning that family time is more important than any work endeavor, no matter how great. Learning how to manage conflict. Learning that it's okay to be quiet and out of the spotlight. Learning that hustle may be helpful or even required in certain seasons, but it's not for forever. Learning that if something isn't working well, I can take responsibility and change it. Learning that God can do far more than I ever could have imagined for myself. If you're reading this, in some big or small way, you've been a part of this adventure, and I want to thank you for your support. Whether you're barely familiar with my work or if you're one of my most seasoned and loyal customers, I thank you for the role you've played in allowing me to live out my dreams, and by extension, help others do the same. It's been a magical, confusing, terrifying, exciting, grace-filled story, one I'm honored to share. Be sure to check in on social media this week (October 31-Nov 3) for a different celebration every day. I'm so thankful!